How to test your memory for bad memory modules? Reboot the PC and close all applications before testing your memory. If the application is NOT closed, that application will occupy that memory space, resulting in skipping memory test for that part. Download Memtest tool at http://www.memtest.org/ or here. 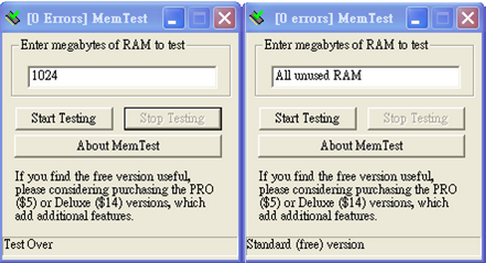 Since this tool can only test 1024 MB at a time, kindly execute it several times as the following steps. Check the memory of your RAM. Type 1024 MB in the first three dialog and type all unused memory in the last dialog. Click start testing on each dialog. Wait for the testing process. If the test coverage reaches 100% with 0 error, it means that one-fourth of your RAM works well. If you see any error message before reaching 100%, the RAM is a defective and your will need to install a new RAM.